Having a happy baby is the best way to have a happy mom–and dad too. But what about those of us with babies that aren’t very good coping with not being held 24 hours a day? I’d like to introduce the Graco Swivi Seat 3-in1 Booster. This product was received free of charge in order to facilitate this review. All thoughts and opinions are my own. A happy baby makes a happy, and productive, mom. The ability to do dishes, prepare meals, fold laundry–simple tasks that shouldn’t consume your life–seem to do just that when you’ve got a demanding baby plastered to your hip. With the Swivi Seat, mom is able to conquer the day with a happy baby nearby. This chair was made for the mom on the move and for baby to sit back and observe her in action! Easy to assemble, use, transport, and clean! With just a few clicks and slips, the Swivi Seat 3-in-1 Booster is ready to use. Because of the lightweight and compact design, this seat is easily transported from one place to another; whether swiveling to catch a new view or taking a day trip to grandma’s, baby can enjoy comfort and familiarity. The seat pad and body support are machine washable, and all you need to clean the base is hot soapy water and a rag. When the day is done, simply slip the tray and tray cover in the dishwasher for a quick clean. Comfortable accommodates your child’s first year and beyond for feeding and play! From infant bottle feedings to family meals at the table, the Swivi Seat Booster will become your child’s favorite seat to eat and play. The tray cover allows for separate playtime and dining when your happy baby begins to explore his world through grabbing and gobbling. An all-in-one alternative for babies who do not tolerate swings or bouncers. 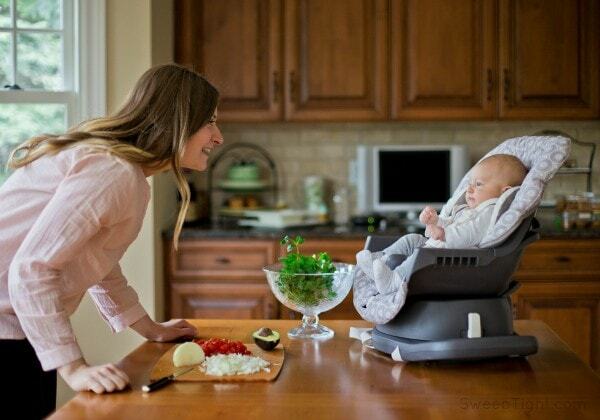 When mom is doing chores around the house baby can safely eat, sleep and play in the Graco Swivi Seat. The booster fits on the counter or tabletops so baby can watch mom go. 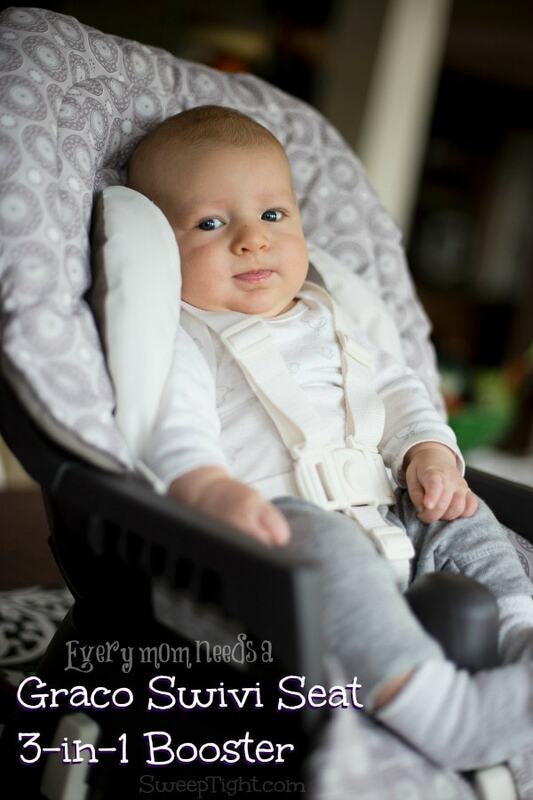 The body support seat pad creates a safe, snug environment for infants to sit up without toppling over. When baby falls asleep after bottle feeding, simply recline the seat to allow for more comfort during nap time. Find out more about how you can have a happy baby at Graco’s website. Follow them on Facebook and Twitter to stay updated on deals, safety recalls, and great tips. This is such a great idea! My daughter is in that stage where she has to see me every second, so I really need this. I think these are so convenient! And it could save your back too, from all of the lifting and moving you no longer havve to do. 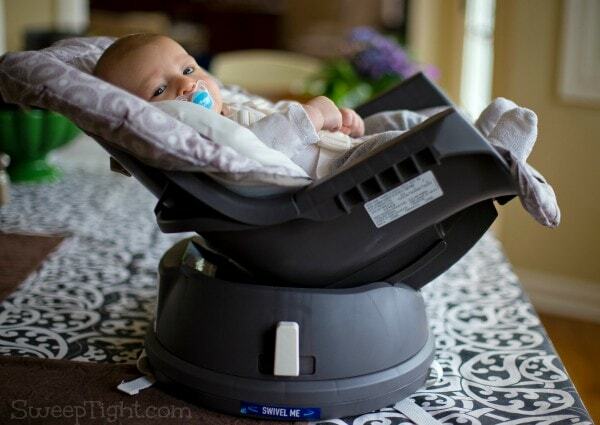 I was always too nervous of a mom to put a bouncer seat on a table….but this looks much safer! I’ll have to tell my expecting niece about it! What a sweet little baby. I love the design of that booster, I could have definitely used that when my 3 kiddos were babies. What a little cutie!!! Such a sweet baby. My niece is expecting and I am sure she will need a safe seat like this for her little bundle of joy. This is a very nice booster seat for baby, and I like that baby can be put on counter while I am cooking! I would love to get one of these seats! This is a cool booster seat, I love that it swivels. You don’t have to pick up the seat and turn it , all you have to do is swivel it. Thank you for sharing this review.